Intergraph spends $89 million on R&D a year, and works closely with customers to prioritize new functionality that will be rolled into core software applications via technical user forums. Many times innovation has come from unexpected places, he pointed out. Who would guess that a couple of bicycle mechanics (the Wright brothers) would invent the airplane? Or that the U.S. Defense Agency would give rise to the Internet? 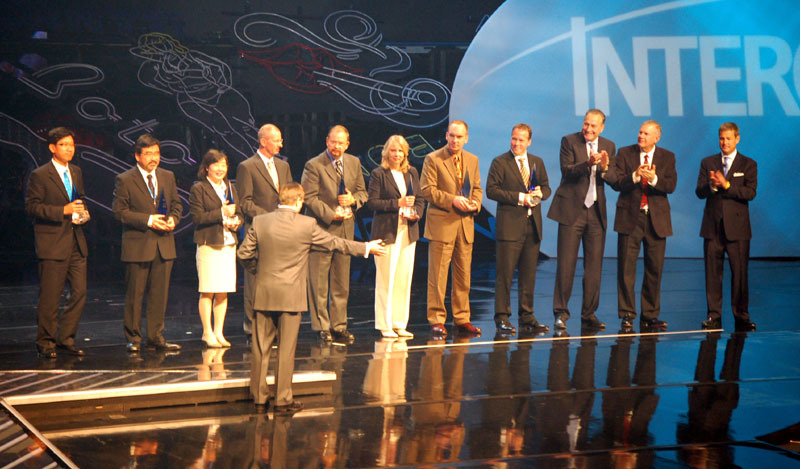 Sapphire Circle Awards recognize great employees of Intergraph selected by their own peers. He recounted his experience from the first discovery of his cancer and the knowledge that it was located in various parts of the body, through to his journey to recovery. “That time taught me patience and encouraged me to go back and race my bike again.” Yet there was no one interested. In cycling, you must have a team to participate, and he had no assurance of a team or income. The DMC is not only a camera, said Madani, it’s a system with many peripherals that complete it which includes a sensor management system, a camera mount that can be sold as standalone, and more. The adoption of the DMC is moving into many emerging markets, with 80 systems in place around the world, and worldwide service centers. 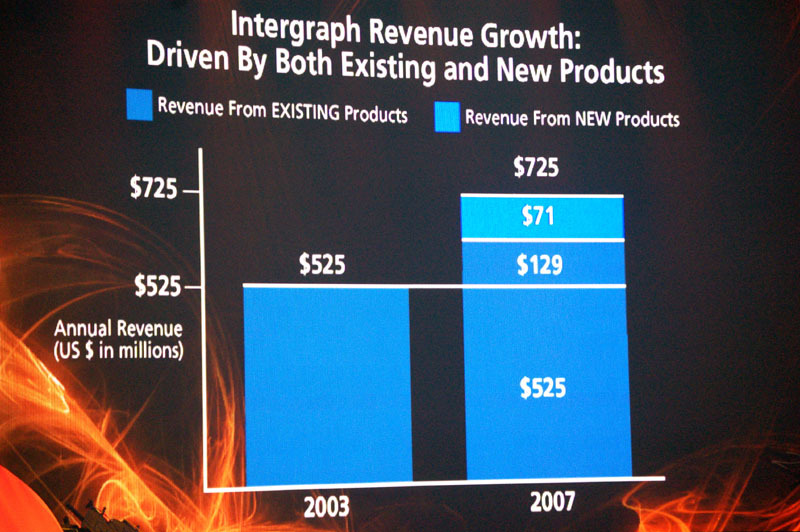 Z/I sold 24 new cameras in 2007, and revenue grew 25% in 2007, DiPietro pointed out. It is widely used by government, commercial photogrammetry and mapping agencies. The new release will include a complete update of sensor peripherals including an improved Z/I Mount, new copy station and readout station, and Z/I Inflight Management Systems Hardware (FMS) SSD. As far as trends go, Dr. Mostafa Madani said that there will be no photo lab, no scanning, no reconstruction of interior orientations as large image programs will go entirely digital in the next three years, giving the example of the National Agriculture Imagery Program (NAIP). There is a trend to larger ortho projects, as with the USDA and NAIP who are now getting 1 and 2 meter coverage of the U.S.
Elevation data will be created from the ingestion of LiDAR data and elevation data by image matching. In the global GIS market, there is a trend toward Geomedia-based stereo compilation and data-centric production workflows such as PixelPipe and TerraShare. More products will be available off the shelf. Madani said that Intergraph will support more satellite sensors. Klaus Neumann said the market leaders in adoption of the DMC are China and Japan. In Asia-Pacific, many companies go directly to digital as they aren’t invested in legacy film systems as we are in the U.S. There are numerous large mapping projects in China. In Europe, there are increased requirements for direct digital acquisition for nationwide ortho programs. Customers want entire countries flown every three years and want to provide high precision for engineering scale projects, incorporating multi-spectral capabilities at a low price range. In helping to keep costs down, smaller aircraft (SSD) are used today to collect data, which helps with fuel costs which helps the customer. Also the use of large format digital data with sensor combinations can save fuel. made available on the Web for public consumption.